I have been so curious about this Tarte Creaseless Concealer for what seems like years now and I am so happy to finally have my hands on it and be trying it out. I honestly must have wanted this since the first say I saw it, which must have been when somebody used it in some sort of YouTube tutorial and that must have been years now. This just seems to be one of those cult classic items which so many people seem to love. 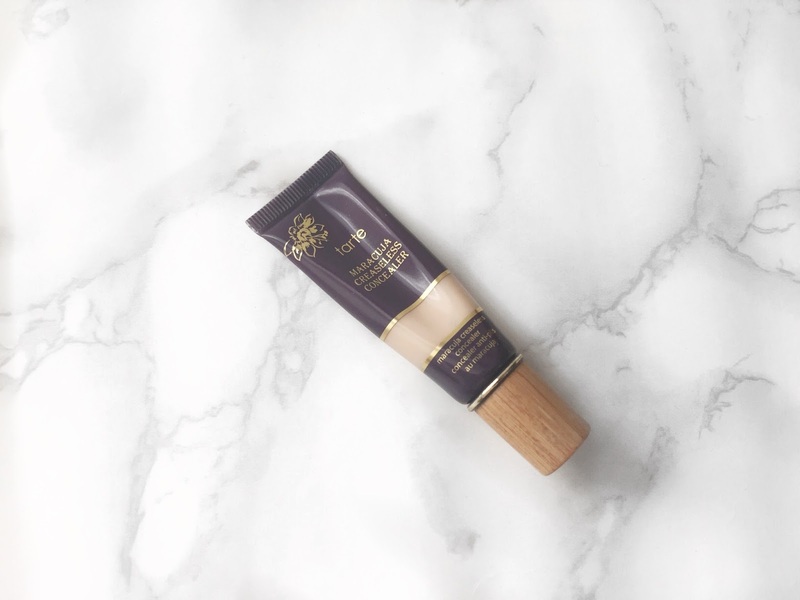 I was always really impressed with the level of coverage that this Tarte concealer seemed to give and how it looked on the skin, so it really spiked my interest and I wanted to try it out for myself. When I decided that I finally wanted to try this out for myself and when I went online to try and pick it up I quickly realised how hard it is to get this stuff here in the UK. I looked through so many websites and on every single one, the price of the concealer itself was nearly double the retail price and if I ordered it from America it was going to cost me an arm and a leg on carriage. I am sure that most of you guys will know that it really doesn’t bother me spending a lot of money on makeup, but I am not going to spend £50 on something when it retails for £20. I will not be ripped off, so I decided just to wait and see if I could find it through any other stockists. I saw that they were actually selling this on QVC, which is a UK shopping channel, but when I look on their website, it just didn’t seem right. There wasn’t many shades and you had to buy a matching sponge with it which made it even more expensive. Then I happened to go onto the Sephora website and I saw this product, so I decided to add it to my basket just to see what the exchange rate was. It actually worked out quite well, so I decided to put in my first ever Sephora order and pick up some other things that I had wanted to try out from the states. I think that it arrived nearly a week later, and I spent days playing with all of my new makeup. The first thing that I noticed about this Tarte Creaseless concealer was how bloody thick it was. And, yes, I had to put the word bloody in there just to reiterate just how thick this really is. When I first went to use this concealer and I went to squeeze some out of the tube and nearly snapped one of my acrylics off because it took that much force to get some out. At first, I thought that it had some kind of stopper in it because it really did take that much effort. After putting in some elbow grease, I finally got some out of the tube and onto the back of my hand. I will say that when this finally came out of the tube, it kind of looked like sausage meat on the back of my hand. As it came out of the nozzle it stayed in a spherical shape and it was pretty firm. I have to admit that when I started to use this concealer, straight away I did like it. Even though it is a thick consistency, when it is applied with a concealer brush and then blended out using a damp Beauty Blender it looks lovely on the skin and seamless with my foundation. I do have to make sure that when I use this concealer I do have to set it pretty quickly because it can crease underneath the eyes because it is so thick, but that isn’t really an issue for me, it just means that I have to move a touch quicker. I also think that the coverage is really lovely with this concealer and it is just the kind of product that I have been looking for. The level of coverage really does remind me of the MAC Studio Fix Concealer, but I do actually think that the Tarte Creaseless Concealer is easier to use because you can work with it more because it is a cream/liquid kind of product. This concealer has no issues hiding all of my darkness and hyperpigmentation and that is all that I look for in a concealer. I really don’t think that there is much more that I can say about this Tarte Creaseless Concealer. I think that the product itself is really beautiful. It is thick, yet it is easy to apply and work into the skin. The level of coverage is very full and hides everything that I need it to, plus it looks very lovely on the skin. I just wish that I had found this concealer sooner because it would have been a great addition to my professional makeup kit. I will leave a link to this concealer down below in case you want to check it out for yourself. Make sure to leave me a comment and let me know if you have tried this product and what you thought about it.